This original and ambitious work looks anew at a series of intellectual debates about the meaning of democracy. Clive Barnett engages with key thinkers in various traditions of democratic theory and demonstrates the importance of a geographical imagination in interpreting contemporary political change. Debates about radical democracy, Barnett argues, have become trapped around a set of oppositions between deliberative and agonistic theories—contrasting thinkers who promote the possibility of rational agreement and those who seek to unmask the role of power or violence or difference in shaping human affairs. While these debates are often framed in terms of consensus versus contestation, Barnett unpacks the assumptions about space and time that underlie different understandings of the sources of political conflict and shows how these differences reflect deeper philosophical commitments to theories of creative action or revived ontologies of “the political.” Rather than developing ideal theories of democracy or models of proper politics, he argues that attention should turn toward the practices of claims-making through which political movements express experiences of injustice and make demands for recognition, redress, and re pair. By rethinking the spatial grammar of discussions of public space, democratic inclusion, and globalization, Barnett develops a conceptual framework for analyzing the crucial roles played by geographical processes in generating and processing contentious politics. 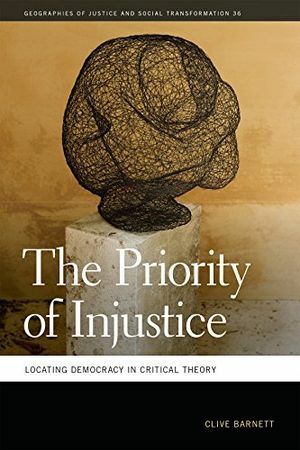 Wenn Sie benötigen für The Priority of Injustice: Locating Democracy in Critical Theory (Geographies of Justice and Social Transformation Ser.) Vatertag durchsuchen unsere Überprüfung erhalten die geeignet Produkte Sie benötigen. Sie können diesen Artikel unten ausführlichere Informationen lesen.